You don’t need skis, a bicycle, or even hiking boots to enjoy Park City’s magnificent mountain scenery or the vibrant history of this bawdy old western mining town. 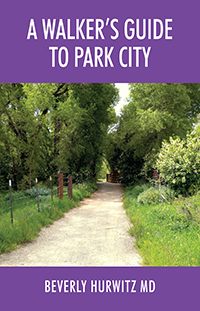 A Walker’s Guide to Park City describes 30 walking routes through urban and wild landscapes. You’ll find maps and directions for exploring spectacular alpine terrain, a century and a half of local Americana, and the ever-evolving culture of a community that has morphed into one of the world’s best-loved travel destinations. Most of these walks are less than 4 miles (6.4 km) in length and are readily accessible by public transportation. Even if you think you know Park City well, you’ll never really know it until you walk it. Are you fit enough to amble around in these mountains? Are you wearing the right kind of shoes? What should you do if you sprain an ankle on the trail? This guidebook also offers practical information about fitness, feet, and footwear from the perspective of a seasoned physician. Beverly Hurwitz, MD was born in Brooklyn, New York in 1948. She first came to Park City to ski in 1973 and she and her husband returned multiple times before becoming full-time residents in 1990. Prior to attending medical school in 1977, Dr. Hurwitz spent 9 years teaching public school health and physical education. Her medical career includes training in physical medicine, pediatrics, neurology, and acupuncture, and decades of clinical experience managing acute and chronic injuries. She’s been walking around Park City with her dachshunds for the past 27 years. Be the first to comment on "“A Walker’s Guide to Park City” Author Events"